Companies can benefit from taking a holistic approach to their employees' well-being. Here's how. The overwhelming majority of well-being programs are focused on physical wellness. Physical wellness is a hot topic, and workplaces all over America are promoting it. The majority of large employers now offer some programs that aim to enhance physical wellness -- from promoting weight loss to smoking cessation to stress management -- or help employees lessen chronic conditions such as back pain. This is good, because employers occupy a unique space when it comes to well-being. Unlike leaders of states, cities, or communities, who have a limited ability to influence residents in their area, business leaders can more directly influence the lives of their employees through programs at work. And when workplace leaders spearhead programs designed to improve their employees' well-being, the chances are good that employees will make positive behavioral changes as long as there is widespread knowledge of the offering. Gallup research shows that 60% of U.S. employees are aware that their company offers a wellness program, and 40% of those who are aware of the program participate in it. In other words, at companies that offer wellness programs, about one in four employees are participating. But there's an added barrier that many companies may be unaware of: The overwhelming majority of well-being programs are focused on physical wellness, but few dedicate time or energy to other key elements of employee well-being. This leaves a substantial gap between what workplaces currently gain from their well-being programs and the gains they could achieve if they broadened their approach, new Gallup research shows. 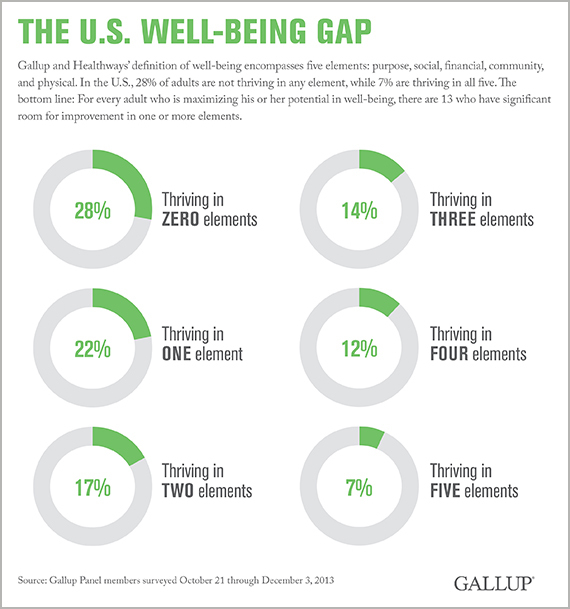 Gallup and Healthways have developed a comprehensive research-based definition of well-being that encompasses five essential elements: purpose, social, financial, community, and physical. Together, these elements provide key insights into whether people find daily life and work experiences fulfilling, have strong and supportive relationships, are financially secure, are proud of and actively involved with their community, and are physically healthy and making smart choices about their health. In the U.S., 28% of adults aged 18 and older are not thriving in any of the well-being elements, while 7% are thriving in all five. So for every adult who is maximizing his or her well-being potential, there are 13 who have significant room for improvement in one or more elements. Miss 68% more work due to poor health annually. Those who are thriving in all five elements miss 1.9 unplanned days of work per year due to poor health, compared with 3.2 unplanned days per year among those who have thriving physical well-being but lack high well-being in the remaining elements. This costs employers an estimated $443,000 in lost productivity per 1,000 employees per year due to missed workdays. Are about three times more likely to file a workers' compensation claim. This adds up to about nine extra claims per year per 1,000 employees, or about $450,000 per year per 1,000 employees, assuming an average direct cost of $50,000 per claim. Are five times more likely to seek out a new employer in the next year and are more than twice as likely to actually change employers. While 39% of those who are in good physical health report that they will look for a job with a different organization in the next year, this drops to just 7% among those who are thriving across all elements. When actual job change is measured, those who are thriving only physically change workplaces 37% more than those who are fully realizing their well-being, thus incurring incremental replacement costs for employers. Are less than half as likely to exhibit adaptability to change and are 26% less likely to bounce back fully after hardship. Change is part of corporate life, as are restructuring, layoffs, mergers, and responses to natural disasters. When change happens, employers rely on their employees to be resilient and to adapt. On key metrics designed to measure resiliency, those who are thriving in all five well-being elements consistently outperform workers who are thriving in physical well-being but not in other elements. Are 19% less likely to have donated to charity in the last year and are 30% less likely to have volunteered in the community. Corporate social responsibility (CSR) can take many forms, including how engaged employees are in their communities. CSR gets a pronounced bump when companies address all facets of well-being rather than just physical wellness. Provide a strong, sustained commitment to well-being. One of the most costly mistakes leaders can make is to treat well-being as just another benefits program or as a flavor-of-the-month initiative. In contrast, leaders who demonstrate a strong commitment to well-being communicate a clear message to their constituents: "Well-being is part of who we are. It is important to us. And it is never, ever going away." For well-being to become integral to an organization's culture, employees must understand that it is here to stay -- and that they are expected to be a part of it. Communicate a clear and consistent definition of what well-being is. Gallup research has shown that well-being interventions are more effective and produce greater improvement when employees understand and internalize what well-being is and how they can benefit from it. Lead by example, set the agenda, and use the bully pulpit. Leaders must do more than talk about well-being to their employees -- they must set an example for them to follow. Showing up in the company fitness center or appearing at local events isn't enough. Leaders must also establish tough, forward-thinking policies that affect every aspect of corporate life, from the foods employees eat in the cafeteria and the incentives they receive for healthy behaviors to the opportunities and encouragement they receive for building their financial security and expectations for how they contribute to their communities. Make sure that employees understand that leadership authentically cares about their well-being. Across multiple Gallup studies, this metric consistently ranks at or near the top of the most important vanguards of well-being. A commitment to well-being must be about more than how a business stands to gain from improvements in employee health and retention or other business outcomes. Employees must understand that their well-being -- and that of their families -- really matters to the company. Measure and monitor the effectiveness of well-being programs. Far too many organizations that execute well-being interventions fail to test whether they actually work. What percentage of employees are participating in well-being programs? How does their well-being change over time? How can the company adjust the programs to increase participation and well-being? Keep the programs that are doing some good. Drop the programs that aren't. Ultimately, companies that have employees with high well-being do more than cultivate and embrace a culture of physical well-being. Instead, their leaders foster and maintain a workplace culture dedicated to holistic well-being across all five key elements, making it "how we do business around here." These companies can lead the charge to better individual and corporate well-being while creating a united commitment to the future of American enterprise. Results are based on a Gallup Panel Web study completed by 16,373 national adults, aged 18 and older, conducted October 21 through December 3, 2013. The Gallup Panel is a probability-based longitudinal panel of U.S. adults who are selected using random-digit-dial (RDD) phone interviews that cover landline and cellphones. Address-based sampling methods are also used to recruit panel members. The Gallup Panel is not an opt-in panel, and members are not given incentives for participating. The sample for this study was weighted to be demographically representative of the U.S. adult population using 2012 Current Population Survey figures. For results based on this sample, one can say that the maximum margin of sampling error is +/- 1 percentage point, at the 95% confidence level. Margins of error are higher for subsamples. In addition to sampling error, question wording and practical difficulties in conducting surveys can introduce error and bias into the findings of public opinion polls. Read a related article on Gallup.com: "Americans' Financial Well-Being Is Lowest, Social Highest"
Merely having a wellness initiative in place offers no guarantee of improving employees' well-being. For companies that provide these programs, it's time for a checkup.